Cats and dogs always have a funny way of bringing you “gifts” that you don't really want. Mice, birds, perhaps the occasion bat? Nine times out of ten, those “gifts” are disposed off, disinfected, and never really given a second thought, but if you knew the truth about bats and domesticated animals, you'd think again before brushing the situation off. 1 - If your pet brings you a bat, it's usually a sign that you have a bat problem. 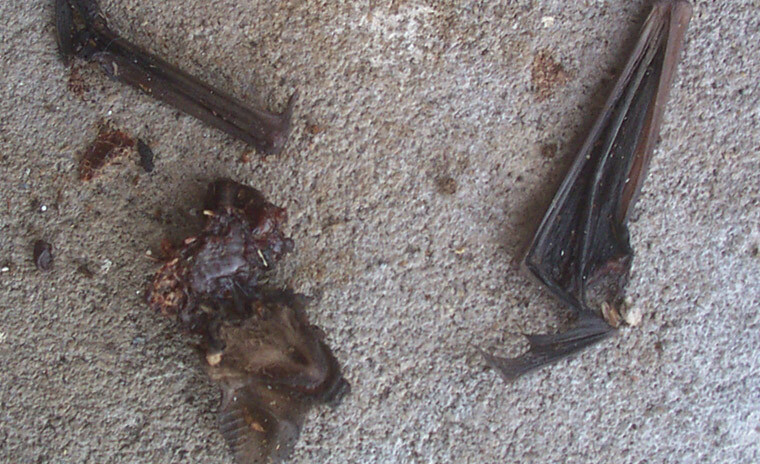 Yep, it's bad news and we're sorry to break it to you, but if your cat or dog brings you a dead bat in its mouth, dropping it at your feet like the best gift ever, there's a chance that the bat is living in YOUR property, which means you have a bat problem. Bats don't venture out of the roost during the day — they are nocturnal animals. If your pet brings you a bat during the day, there's a chance the bat has been dropped by another predator, has been kicked out of the roost, or has fallen to the ground as it's tried to fly. In any case; it could be diseased, it could have been in contact with another potentially diseased animal, or it could have been poisoned. In turn, your pet might be diseased, might have just come into contact with a potentially diseased animal, and might have just ingested poison. That brings us nicely to our next point! 2 - If your pet brings you a bat, it could fall prey to secondary poisoning. Okay, why is that bat dead? It might have died of natural causes, yes; but there's also a chance it might have died of non-natural causes, such as poisoning. If that bat has died as a result of eating poison, there is a chance that there will still be enough poison in that teeny-tiny body to cause your pet some harm, should it accidentally ingest a bit. This might sound like a crazy scenario, but it's a familiar one. Rats and mice are now showing a very high tolerance to typical rodenticides, and this means that they are strolling around and going about life with many times the recommended and usual dosage of rat poison in their systems. Another animal, such as a cat, comes along and chases the rat, kills it, and then eats some of it, and it will have eaten much more poison than it should have done. In turn, that predatory domestic animal could die. At the very least, it is likely to be quite sick for a while. 3 - If your pet brings you a bat, it has potentially been subjected to the rabies virus. Rabies is just one of many diseases that bats can carry around, and if your pet hasn't been vaccinated against the virus, the likely result is death. Not just for the pet either; if your pet bites you and the virus is allowed to get into your bloodstream, you will then have the rabies virus too. If you don't get treatment quickly enough, you will die. Treatment is a very painful, long, and no doubt costly series of injections. You'll soon learn your lesson! 4 - If your pet brings you a bat, it has been potentially been subjected to a string of other diseases. 5 - If your pet brings you a bat, it has been potentially been subjected to parasites. Well, things just keep on getting worse for you and your pampered pooch or cherished cat! Bat mites are a real thing. They're a bit like bed bugs, except bats bring them to the party, and if they find a nice, cool place to hang out, they can live for as long as a year. That's quite a long time in terms of parasites. Not just bat bugs joining the party, ticks and fleas can all be carried by a host bat, which can also be passed on to your pets. In theory, using your pets to get rid of pests might seem like the natural and more direct approach, but it certainly comes with its fair share of concerns. A wildlife control exterminator or bat removal expert will be able to dispel many of those concerns, and the service is usually much more affordable than you'd think! Go back to the Bat Removal page, or learn about bats in the attic with my Bats in the Attic guide.